Since everything we love to ingest is bad for us these days, it should come as no surprise that the “experts” are busy linking grilling and smoking to cancer. Grilling and smoking pollute the air (is that an odor or a fragrance? ), so we outdoor cooks are inhaling not only vegetable smoke (from wood or charcoal) but smoke and chemicals in the charcoal additives, in the propane, or in the charcoal lighter. And that’s just the tip of the briquet. The grilling of meat, poultry, and fish have been linked to heterocyclic amines (HCAs) and benzopyrene, and both have caused tumors in laboratory animals. The food police, animal rights groups, and vegans were dancing in the streets–watch out for that bus!–over these revelations for a while but now the controversy has uh, cooled down a bit. When we studied some of these reports, we found an amazing number of weasel words but no real proof of anything. The American Institute for Cancer Research Newsletter used the words “suspected to promote cancer,” and research has linked HCAs to cancer, but the link must be tenuous because to our knowledge, no cause and effect relationship between grilled meats and cancer has ever been proven, and, amazingly enough, no government agency has ever recommended eliminating grilling and smoking as cooking methods. Remove excess fat and/or skin from meat and poultry before grilling. Use the indirect grilling method for cooking high-fat foods (smoking also works well). 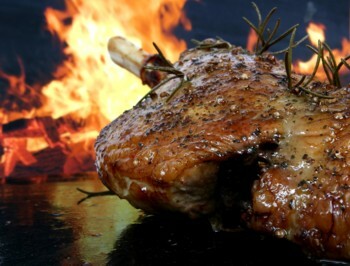 Avoid contact between the meat and the flames, and, obviously, don’t allow flare-ups to occur. Marinating the meat for even a few minutes reduces HCA formation when the meat is grilled.